The rotator cuff is the confluence of the tendons of four muscles that encompass the ball joint (humeral head) of the shoulder (see Figures 1, 2). The muscles originate on the shoulder blade (scapula) and attach on the arm bone (humerus). The rotator cuff has two functions. It provides stability to the shallow shoulder (glenohumeral) joint. Its second function is to provide motors (muscles) to move the shoulder. As time passes and we age, so does the rotator cuff. The rotator cuff tendon degenerates with age. 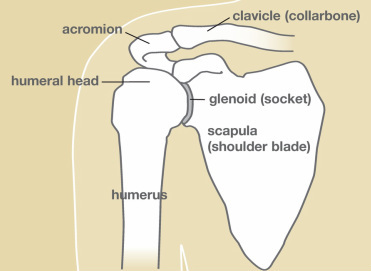 It may also undergo wear and tear as it rubs between the acromion (tip of the shoulder blade) and the humeral head. 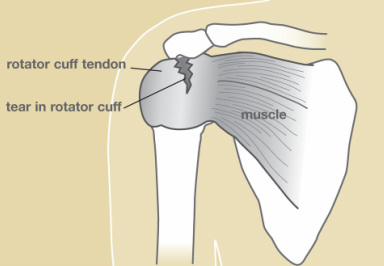 The rotator cuff tendon may become thickened and inflamed, which may be described as shoulder impingement or impingement syndrome. In the early stages of shoulder impingement, the symptoms are usually mild and patients tend not to seek treatment during this time. The symptoms include pain, weakness, restricted motion, a feeling of instability, catching, and locking. Shoulder impingement is common in young athletes and middle-aged people, especially those who do daily repetitive activities that involve overhead arm motions, such as pitching, throwing, tennis, or racquetball. The symptoms mentioned above are usually aggravated in certain positions, such as reaching back, for example, to fasten a seat belt or pick up a briefcase out of the back seat. History and physical examination are the initial evaluation that leads to diagnosis of shoulder impingement. Your surgeon will check your neck and shoulder for pain, tenderness, deformity, weakness, and loss of range of motion. X-rays are done to check for calcifications, arthritis, or other bone problems. MRI may ordered to assess the tendons for inflammation and tears. Steroid injections and arthroscopy may be used as diagnostic and therapeutic tools. The goal of the shoulder impingement treatment is to reduce pain and restore shoulder function. Non-Surgical Treatment: Alterations in activities, such as avoiding overhead movements, and learning to use the shoulder in a safer, more comfortable manner is important. Steroid injections and anti-inflammatory medications such as ibuprofen and naproxen help reduce pain and swelling. Physical therapy with stretching exercises can be very effective in improving the mobility and strengthen of shoulder muscles. Surgical Treatment: Surgical intervention is usually the last option and can involve either arthroscopy or the open surgical technique. In arthroscopy, thin surgical instruments are inserted into two or three small puncture wounds around your shoulder. Your surgeon then examines the inside of your shoulder through a fiberoptic scope connected to a television camera. 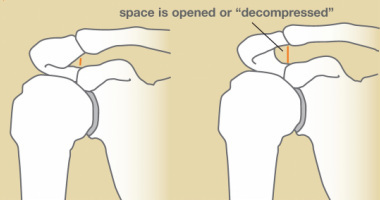 With both techniques, the surgeon can remove inflamed bursa, impinging bone spurs, decompress or open up the space available for the rotator cuff (see Figure 3). The end of the clavicle (collarbone) may be removed if it has impinging spurs. Figure 3. Pre- and post-surgery. After surgery, your arm will be placed in a sling, which allows for early healing. It is important that you start physical therapy soon after surgery, which will help you regain shoulder range of motion and increase arm strength. It usually takes 2 to 4 months for the pain to completely subside but it may take up to a year.